IFTN caught up with Northern Irish filmmaker Sean Murray to discuss his new documentary ‘Unquiet Graves’ and the importance of not censoring the past. ‘Unquiet Graves’ investigates the role the British government played in the murder of over 120 civilians during the Glenanne Gang’s campaign in Counties Armagh and Tyrone from July 1972 to 1978. The feature-length documentary details how members of the RUC and UDR (a British Army regiment) were centrally involved in these murders during the conflict, revealing how state collusion accommodated these actions. The so-called Glenanne Gang rampaged through Counties Tyrone and Armagh and across the Irish Republic in a campaign that lasted from July 1972 to the end of 1978. The powerful work, narrated by Stephen Rea, continues Seán Murray’s investigation into the legacy of the Northern Irish conflict through this testimony-based documentary. Seán Murray is a documentarian and filmmaker from Belfast. He has made a number of short films and documentaries that have been screened in film festivals around Ireland, the UK and Europe including ‘Broken Lives: The Legacy of Conflict’ and ‘Fractured City’. His work mainly reflects the social, economic and political landscape of Belfast, with a particular view to redressing particular historical events during the recent conflict in Northern Ireland. IFTN journalist Nathan Griffin caught up with Sean to find out more about the documentary. IFTN: What inspired you to pursue the documentary in the first place? IFTN: The documentary is split between a number of different mediums such as interviews and re-enactments. How did you decide upon that format when you were approaching the project? IFTN: As you mentioned, it is a very delicate subject matter. How did you choose your exact approach to telling the story. Were there any considerations made when approaching the structure of the story unfolding as it did in the documentary? Sean: “The good thing about the Glenanne series and making the film, was that there's so much information and it is very, very daunting at the beginning of the process to have so much information. When you're trying to deal with 120 civilian’s killings, it's trying to pick out a number of those killings which fit into an order that would have universal appeal. IFTN: As you said, you couldn't include everything. In terms of the editorial process, was there anything that you deemed too sensitive or possibly too biased to include in the documentary or how exactly did you decide upon that? IFTN: You've mentioned John Weir who is a self-confessed Glenanne gang member. How exactly did the opportunity to interview him come about and how crucial was that to telling the story and getting a perspective from the other side? IFTN: In the documentary, you speak to a wide range of people including Pat Campbell's widow, Margaret. As a director, how much did your approach vary from person to person, in terms of going from someone like John Weir to someone like Margaret? IFTN: There is a significantly different mentality between someone from Northern Ireland who has been affected by the troubles and a person from the Republic, who may be a bit desensitized to the whole thing. Have you experienced difficulties conveying this information to someone who may not be as aware of the extent of what the Glennane Gang did, someone who might view it as a conspiracy theory or that might find it hard to believe the sheer extent of state collusion in some of these murders? IFTN: Stephen Rea has been quite tightly associated with the troubles through his time as the voice of Gerry Adams, if I am not mistaken? How exactly did you get him involved in the documentary? IFTN: The movie came out on Friday, March 1st in Northern Ireland. What exactly are the plans for a wider release to the Republic of Ireland? 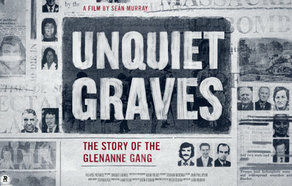 ‘Unquiet Graves’ is currently on limited release in Northern Irish cinemas.